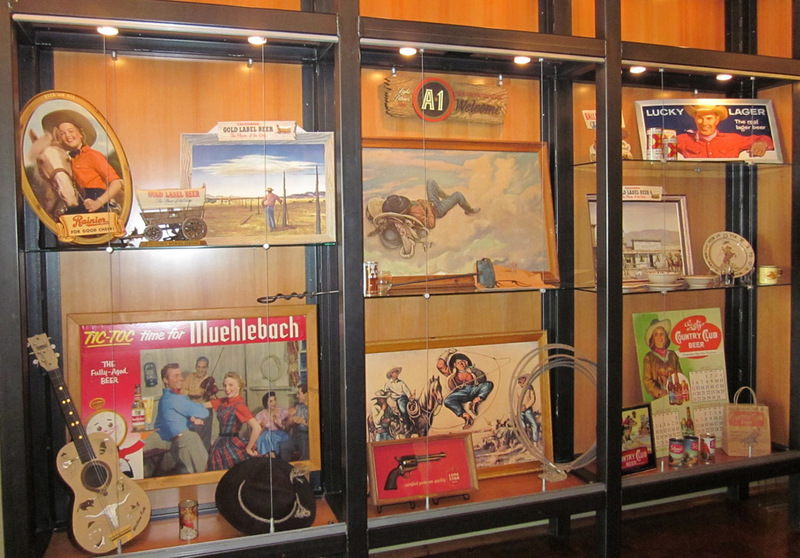 One of many displays appearing next to the Muehlebach Room at Boulevard Brewing in Kansas City. Marcia Butterbaugh, Display Curator for Boulevard, manages the display projects for the brewery. She is sharing some of them for this website. This first one features western-themed breweriana. St. Louis claims to be the Gateway to the West, but in the world of brewing, the gateway to western brands began across the state in Kansas City, Missouri and points beyond. 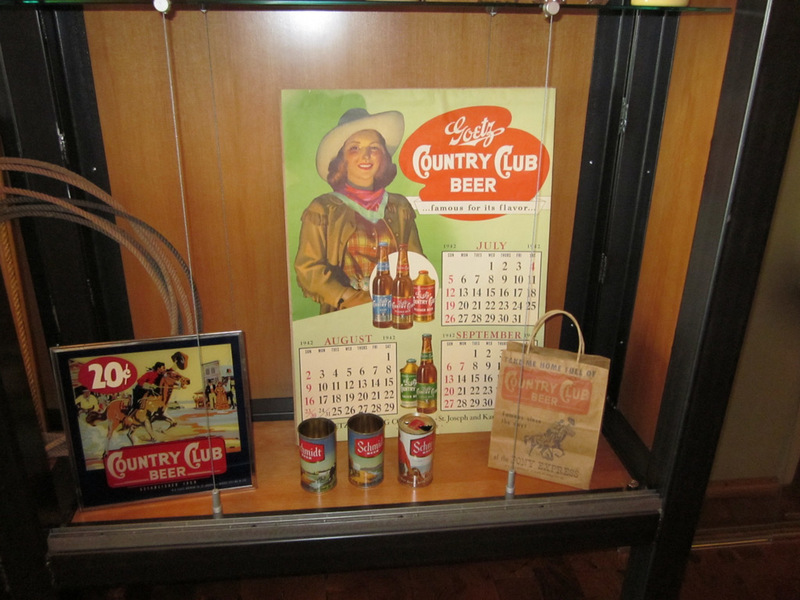 Muehlebach Brewing in Kansas City, Storz Brewing in Omaha and Goetz Country Club in St. Joseph sold their brands with a cowboy and Wild West theme at some point in their brewing history. Occasionally brewers in St. Louis, such as Falstaff, marketed brands to western markets, but the real “wild west” themes were found much farther west. Goetz Country chose to tie in with the Pony Express to sell their beer, featuring the mail delivery by horse and rider from St. Joseph to California. Muehlebach occasionally used a western them depicting square dancers in some of their print advertising but the theme did not last beyond a short campaign in the mid-1950s. One of the most successful attempts was by the California Brewing Company in San Francisco. 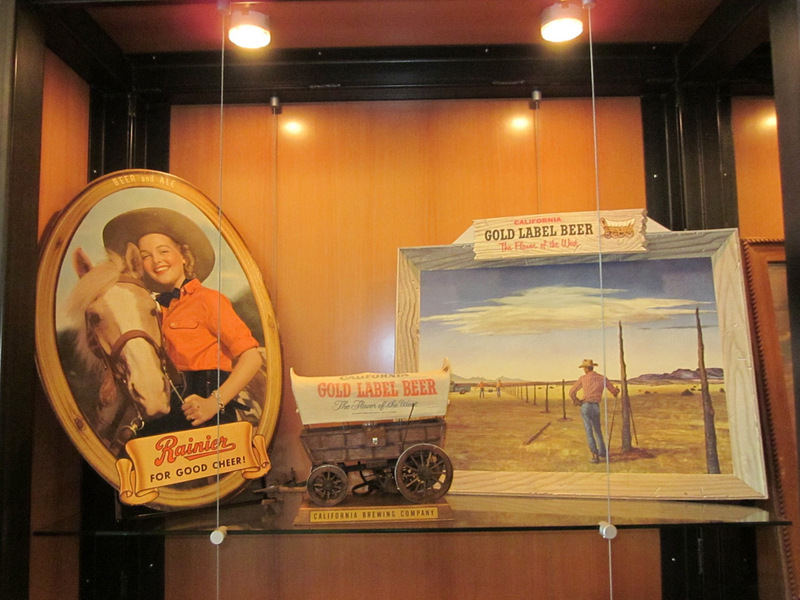 The brewery spent many years featuring colorful Western imagery in its advertising, signage and point of sale items. Ignoring the St. Louis claim of the Gateway to the West, the A-1 Brand in Arizona claimed to be the entrance to the real west with their long-running slogan “A-1, The Western Way to Say Welcome.” The slogan appeared on signs, drinking glasses, and in magazine and newspaper ads across Arizona, New Mexico, Nevada and California. The theme was also used on their beer cans and beer bottles. The Texas brewer, Lone Star, produced a series of framed antique gun replicas displayed in bars and taverns. A smaller brewer—Rainier Brewing, from Seattle, Washington—depicted a cowgirl and horse on some of its point of sale items. In the mid-1950s, the midwestern brewers joined the bandwagon and packaged their brands in beer cans designed to appeal to the western consumer with a rodeo or square dancing scenario. Schmidt Beer from South Bend, Indiana and Meister Brau from Chicago, were among other midwestern brewers who attempted to appeal to the cowboy, but it never really caught on and the themes faded away in the mid-1970s. Of course there were some Eastern companies who attempted to promote their beers out west—one of which was Ballantine Beer from New Jersey. Ballantine marketed their beer and ale to the western consumer, but never really convinced a cowboy in Arizona to drink a beer from the Atlantic coast. 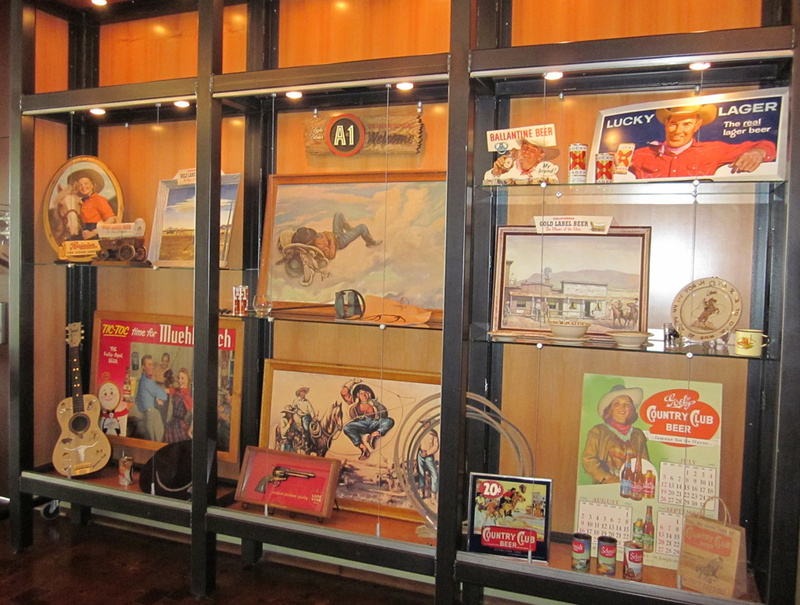 This display is a small sampling of Western advertising used in the 1940s and ‘50s. Most of these brands bit the dust, leaving the “western” branding behind. 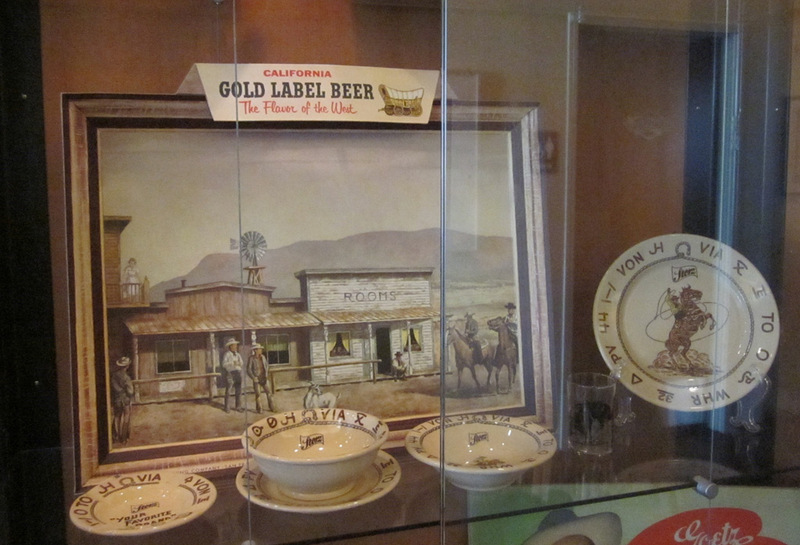 California Brewing marketed its Gold Label Beer as the “Flavor of the West” with a series of three-dimensional cardboard signs featuring old west scenes. The covered wagon was a major image in the advertising. The brewery’s point of purchase items included a light up covered wagon sign. It used the same image on its early flat top beer cans. Rainier Brewing(Seattle) opted to appeal to the female consumer with a cardboard sign of a cowgirl and her horse. In the early 1950s, square dancing was popular. Muehlebach of Kansas City chose to feature signs with dancing couples. 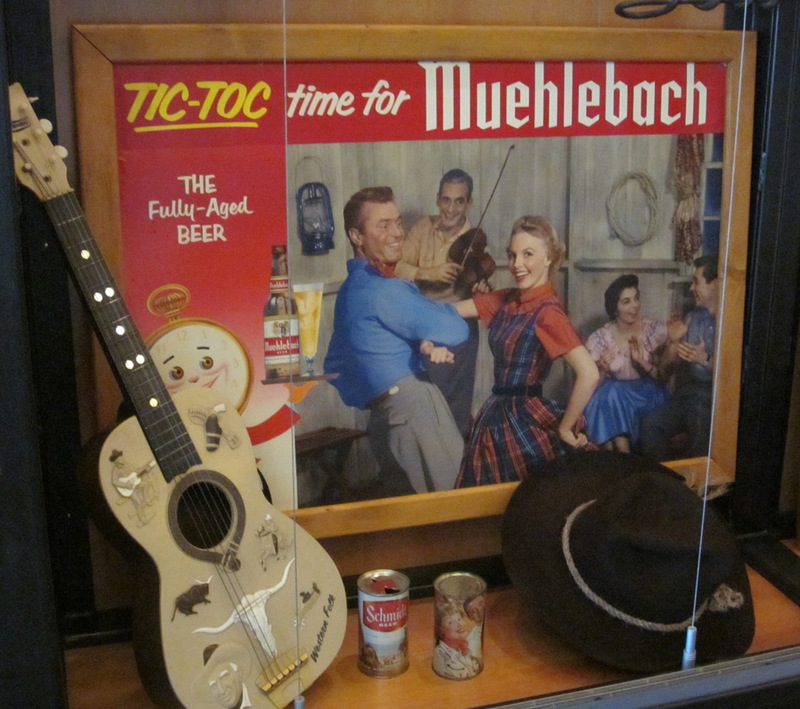 The brewery even composed a song to accompany the advertising – Tic-Toc Muehlebach. Around the same time, Meister Brau of Chicago used a square dancing theme on one of its 1950s flat top cans in the Happy Days series. Arizona Brewing’s slogan, A-1 The Western Way to Say Welcome, advertised its A-1 Pilsener Beer during the late 1940s and early 1950s. The logo featured a branding-iron style lettering used on signs, cans and glassware. The brewery commissioned Lon Megargee to produce five western-themed paintings. 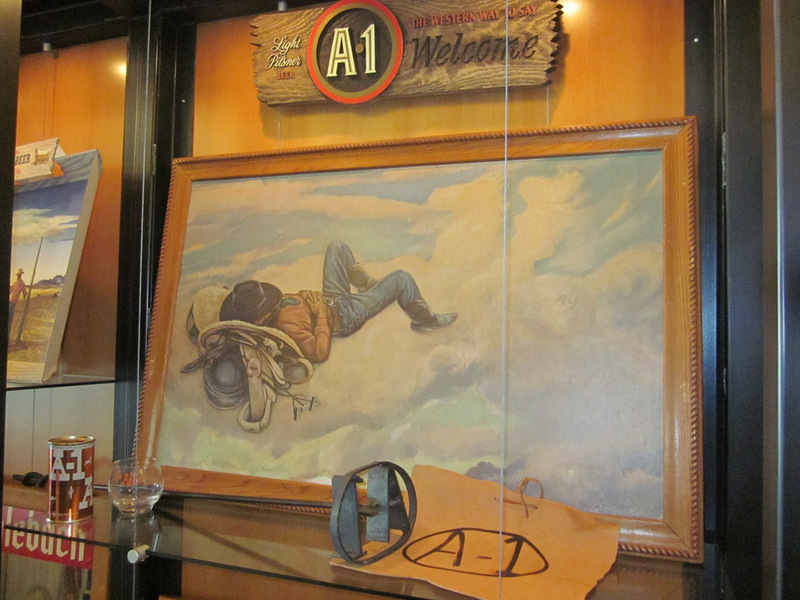 The first, in 1948, was the Cowboy’s Dream that depicted a cowboy dreaming of A-1 beer with a hint of a lady on a horse in the clouds. Guns and horses were popular western symbols to promote beer. 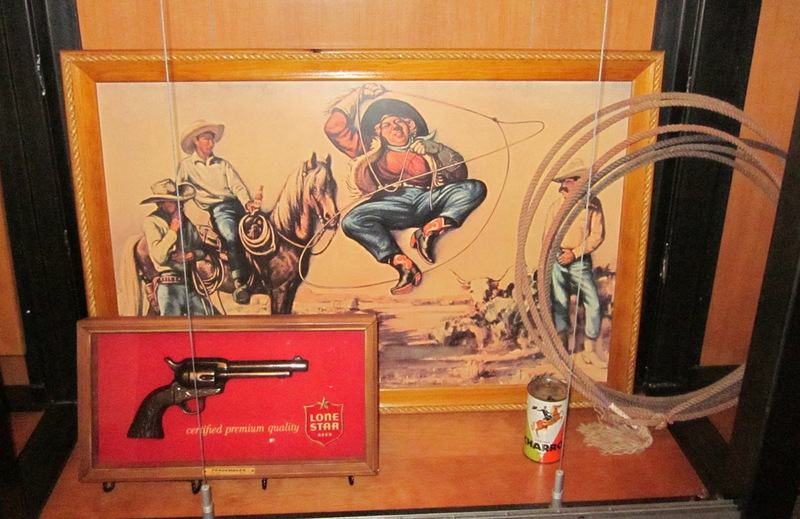 In 1950, Arizona Brewing’s third commissioned painting, The Dude Lady, featured a bottle of A-1 being enjoyed by a cowboy while watching a lariat-skipping cowgirl. Lone Star beer identified with a Colt single action “peacemaker” to promote its beer. Charro Cerveza by Gulf Brewing, Houston, TX produced its only can – a colorful flat top showing a Spanish cowboy atop a bucking bronco. Like the Marlboro Man, California’s Lucky Lager beer depicted a cowboy stating that Lucky is the Real Lager Beer. The bright red X was used for several decades on Lucky’s cans and in its advertising. A similar theme was marketed by New Jersey’s Ballantine beer where a cowboy claimed it was his brand. Another Gold Label Beer cardboard sign showed a western town. Unlike A-1 Beer, this series of signs did not show the product in the illustration. Instead the name is prominently displayed at the top of the signs. In the 1940s and ‘50s, Storz Brewing from Omaha, NE, commissioned personalized dishes and glassware for its famous hunting lodge that the Storz family operated in northern Nebraska. The M. K. Goetz Brewing Company of St. Joseph and Kansas City, MO marketed its Country Club Beer to a regional market for many years. A series of large calendars were produced in the 1950s featuring a western theme. An earlier campaign identified with the Pony Express Run which ran from St. Joseph MO to San Francisco CA. Schmidt Beer was marketed by a number of breweries in the Midwest with a series of flat top and tab top cans, several of which featured western scenes. Copyright © 2013 www.beercanhistory.com, All Rights Reserved. Last modified January 27, 2013.